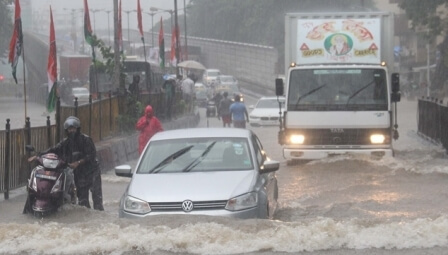 Mumbai: For the third day in a row, heavy rainfall continued to pound the city on Tuesday, leading to waterlogged roads, traffic jams, delayed flight, train and bus services. The city recorded its highest single-day rainfall since 2015. Since Sunday morning, Mumbai has recorded 100 mm rain every day for the past three days. In the 24 hours starting from 8.30am on Monday, Santacruz recorded 184.3mm rain (very heavy), which is the highest one-day rainfall in Mumbai since 2015. In the same period, Colaba recorded 165.8mm rain (very heavy). As per the weather department’s classification, 15.6mm to 64.4mm of rain is considered ‘moderate’, 64.5mm to 115.5mm ‘heavy’, 115.6mm to 204.4mm ‘very heavy’ and more than 204.5mm is ‘extreme’. At 274.1mm, the highest July rain for the decade was recorded on July 15, 2009. The all-time high for July is 944.2mm, recorded on July 26, 2005. It rained much more in the suburbs than in south Mumbai overnight. Between 8.30pm Monday and 8.30am Tuesday, the suburbs recorded 105.6mm (heavy) rain, and south Mumbai 55.6mm (moderate). Rainfall over the past 24 hours has been the second-heaviest witnessed so far this season in Mumbai; the highest rainfall of this season was on June 24-25, when the city experienced 231.4mm rain in 24 hours.